With all the scholarly attention given to the Scriptures in the Christian community, it is remarkable how little study has been done of the Gospel healing stories. These stories embody and reflect powerful interpersonal dynamics, which are being rediscovered today in the practice of psychotherapy. As a healer, Jesus forms a bridge between the most ancient of healers, the shamans, and recent developments in psychosomatic medicine and depth psychology. 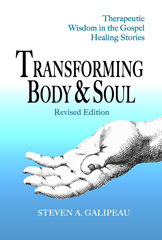 Body and soul are intimately connected–health in one is often reflected in wholeness in the other.